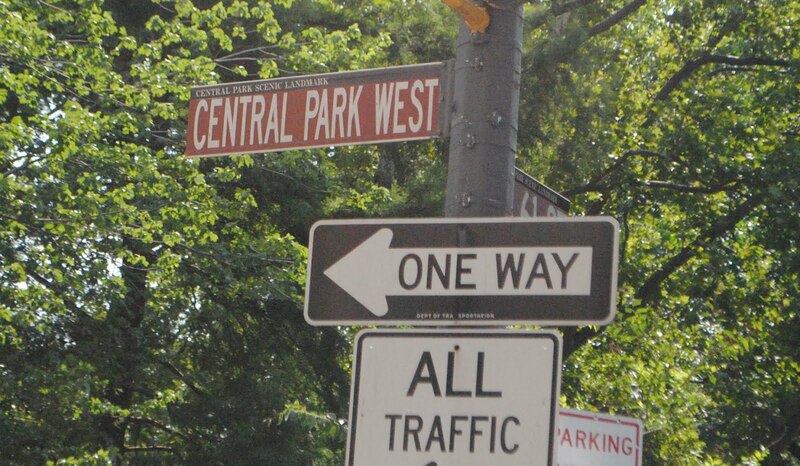 So....when we last left our story, we were just about to leave Central Park. We had decided that we wouldn't go back and try to get the Jimmy Fallon tickets. We already had the 911 tickets and the Fallon tickets weren't a sure thing. Different people wanted to do different things now, so we split up to meet again in an hour or so. Vickie, Sally Anne and Lucy went to FAO Schwartz. Michelle and I went to find Serendipity. It was from the movie of the same title. 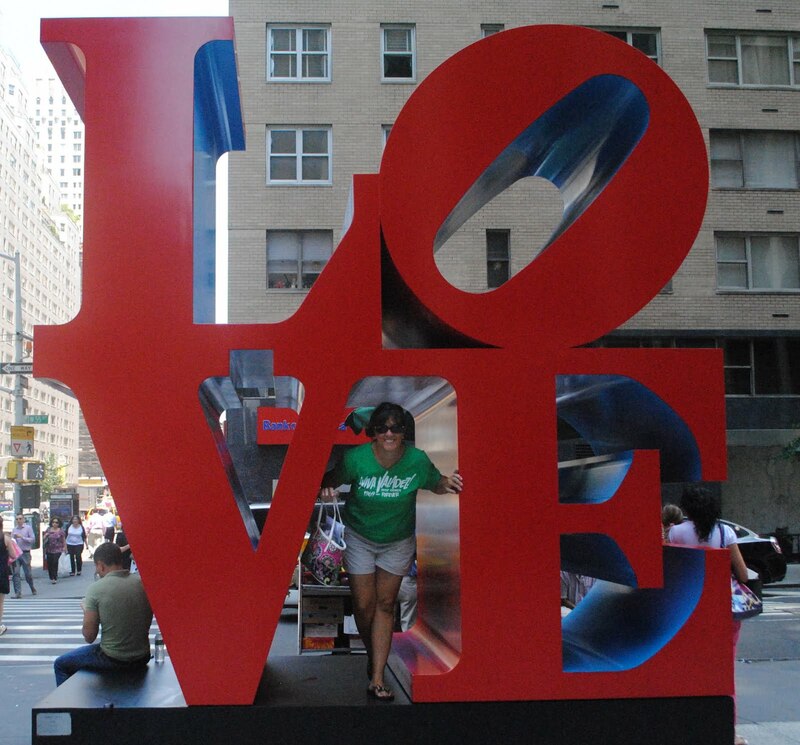 We had to walk past the Love sign on the way to Serendipity. Michelle was such a willing model. She's pretty cute too. We found the shop/restaurant and we also found rude staff. We didn't stay long. It was time to meet up with the girls. We took a taxi to South Street Sea Port. Remember that we were there on Monday night? We were going to the half price ticket outlet. We wanted to get tickets for a show for that night. We couldn't go to the one in Times Square because they didn't open till 3:00 and we would be at the 911 Memorial. The sea port outlet opened earlier. After a little game of hide and seek with each other, we met and started deciding what to see. We decided on "Nice Work If You Can Get It" with Matthew Broderick. I immediately fell in love with the idea of seeing Ferris Bueller all grown up. Tickets in hand, it was time to head to the 911 Memorial. By the time you pass this sign, you have been in line a long time. 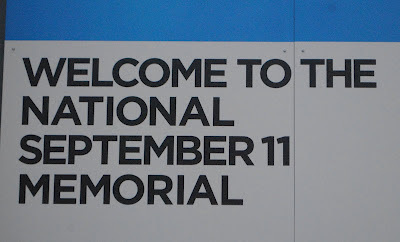 But, from the time you pass this sign to the time you actually get into the memorial itself is like airpot security except you don't have to take your shoes off. The security people were rude and I didn't see any reason for that. The people waiting in line were very orderly and we weren't rude. Why did they have to be? We were just as hot as they were, I think. Once we got inside, there were a few things to see. There are two very large waterfalls where the towers used to stand. It was impossible to get a good picture of them. They are just too big, but very impressive. This is going to be the museum when they get it done. This is the Surviver Tree. The brochure said that they found the uprooted tree when they were cleaning up the rumble and took it and planted it in a park in the city. When the memorial was up and running, they brought it back to the site. People leave things by it in memory of people that lost their lives on September 11, 2001. It was time to grab a cab and head home to get cleaned up for the evening. Five women getting ready in a small three room one bathroom apartment was an adventure, but we made it work. People were drying their hair in the kitchen and putting their make up on with a mirror propped up in their lap on the floor. Women are so smart like that. In no time at all, we were out the door. Here are the five of us all clean and ready to get back on the train for the city. We made it to the Imperial Theatre with just a few minutes to spare. There was just enough time to grab a million dollar drink and get our seats. The one thing I had a hard time getting used to was the drinks at the theatres. They all have commemerative cups for the show you are seeing and that is the only kind of cup you can get. Tonight, a Bacardi and diet cost me $15. for the first drink. If you wanted a refill, it was only $10. Regardless of the drink cost, the show was amazing. I loved every minute. From the first time I saw Matthew Broderick, I never thought of Ferris Bueller. He was totally Jimmy Winter. Vickie and I got a big kick out of the Scientology center across the street. The very first night we were in Times Square, we were approached by some Scientology people who gave us cards and wanted us to come and be tested for Scientology. Ahhh, no thank you! After a short wait, the actors started to come out. This is Kelli O'Hara. She was the female lead. She played Billie Bendix. 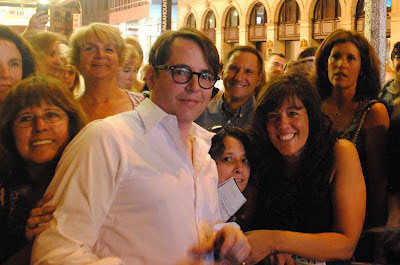 Here we are with Matthew Broderick. He was a little stand offish, we thought. If it wasn't for people like us, he wouldn't have a career. He could have been nicer. The other actors were very nice and friendly. We met and got autographs and pictures of many others, but I didn't think we needed to see them all here. Estelle Parsons played the mother, but she never came out. While we were waiting for the actors to come out, everyone that is waiting is talking and having a good time. Vickie asked a lady if she wanted to take our picture. She told her we were famous. We had been on tv that morning. The lady looked puzzled and didn't answer. We all cracked up. I love my Vickie!! By this time, we were all starving. We hadn't eaten anything to speak of since that pizza earlier in the day. 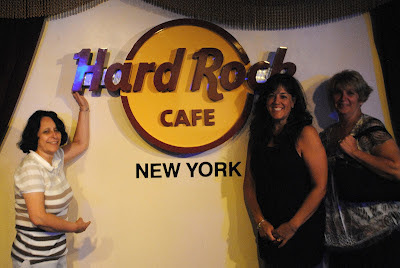 Some of us thought we were going to Times Square and some of us thought we were going to an Italian place that someone in the crowd was talking about. What happened was that we got split up. It was all good. We had fun anyway. Vickie and Sally Anne went to the Italian place and Michelle, Lucy and I ended up in Times Square. I didn't mind that at all. Here's Michelle and Lucy right in the thick of it. I just can't express to you what an amazing place it really is. People of all shape, size, age and race in one place. Hundreds of thousands of people, I would guess. The people watching is fantastic. After checking on the wait time in a couple places, we decided on Hard Rock Cafe for dinner. Some nice person took our picture in front of this sign while we waited for our table. We were seated and we talked and talked about our last two incredible days. We really had an amazing time together. We finished eating and took one last stroll in Times Square. We grabbed a cab and headed back to the apartment. For some reason, I think we stopped at the 24 hour Rite Aid on the walk home. Whether we did or not, it was close to 1:00 a.m. when we got home. 21 hours after we had first gotten up to start this fantastic day! I am exhausted reading what all you did in 21 hours. I bet that Memorial was so touching to be up close and that tree was amazing. I love Matthew Broderick, what a great picture of you peeking behind him. Glad you said No Thanks to the Scientology invite. It was nice that you were able to break up the group and go your own way at times. Another fantastic day for sure!